1947-1954 Bumper Guards - GM Truck Bumper guards are sold in pairs and come with mounting hardware. 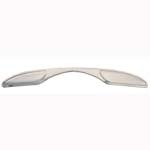 1947-1955 Front Chrome Bumper Includes 5 year warranty against fading and peeling. 1947-1953 Rear Chrome Bumper Includes 5 year warranty against fading and peeling. 1954-1955 Rear Stepside Chrome Bumper Includes 5 year warranty to never fade or peel. 1947-1953 Rear Stepside Short Bed Roll Pan (Louvered) - GM Truck This roll pan does not have a cut out for the license plate. 1947-1953 Rear Stepside Short Bed Roll Pan (With Box & Louvered) - GM Truck This roll pan does have a cut out for the license plate. 1947-1953 Rear Bumper Filler Panel - GM Truck Located between the rear bumper and the tailgate.